Thanksgiving has always been one of my family's favorite holidays. 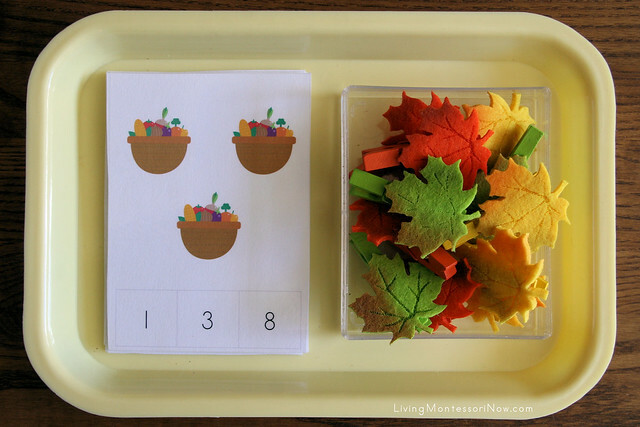 Today, I'm sharing ideas for Montessori-inspired math activities to go along with some wonderful free Thanksgiving printables I found online. The hands-on activities are for preschoolers through first graders. I have too many activities here to share presentation ideas without having a post that's way too long. So check out my previous posts at PreK + K Sharing for presentation ideas. The printables I'm using are from Homeschool Creations, 2 Teaching Mommies, and 3 Dinosaurs. You'll find many more links to both printables and activities of all kinds at the end of the post. This activity uses the Thanksgiving Printables ~ Kindergarten from Homeschool Creations. There are pictures of whipped cream that you can use. There's also the suggestion to use cotton balls for the whipped cream. Since I like to use 3-dimensional objects whenever possible, I used cotton balls for the whipped cream. The tray is an inexpensive wooden tray from the hobby store. 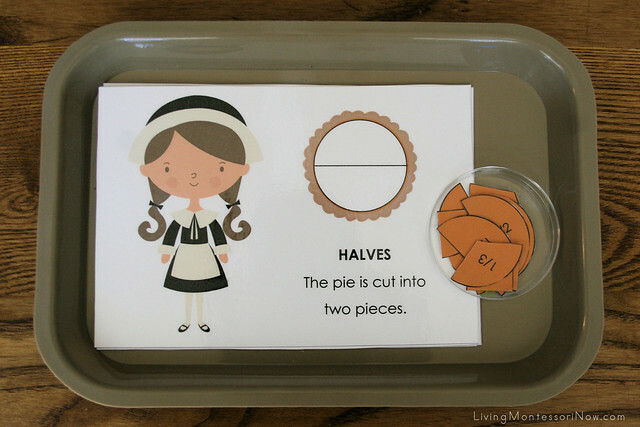 This activity uses the Thanksgiving Printables ~ Kindergarten from Homeschool Creations. This tray was very simple to prepare. I used a medium-size tray from Montessori Services, which is very handy and more difficult to find locally than larger trays. I just printed out the cards, laminated them, and cut them out. If your activity will have heavy use, be sure to cut out your cards before laminating and leave a laminate edge. I found these cute autumn leaf clothespins on sale at Michaels hobby store. To follow Montessori principles perfectly, it would be best for the clothespins to be all one color so that only the number of objects changes (Montessori principle of isolation of quality). But the clothespins were just too cute in the three colors, so I used them as is. If you have a child who would be confused by that, you can always use plain clothespins or even leaf clothespins all in one color. I use a ¼” round color coding label in the color of the tray on the back of each card to correlate with the correct position of the clothespin. This serves as a control of error (instant self-correction devise). This activity is a mixture of math and history. It uses the Thanksgiving Timeline printable from 2 Teaching Mommies. 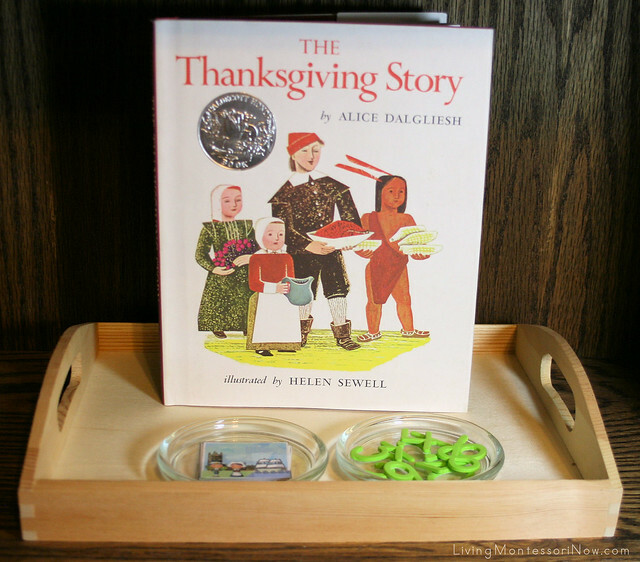 I recommend adding a book of the Thanksgiving story on the tray or nearby on the shelf. You could use any numbers you have available. In addition to using the timeline cards, I added foam numbers from the hobby store to make an activity placing the timeline pictures in order with the numbers below the pictures. You could talk about what happens 1st, 2nd, 3rd, and so on. 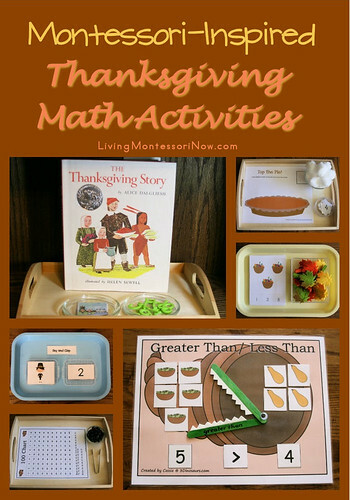 This activity is both a math and language activity and uses the Thanksgiving Printables ~ Kindergarten from Homeschool Creations. 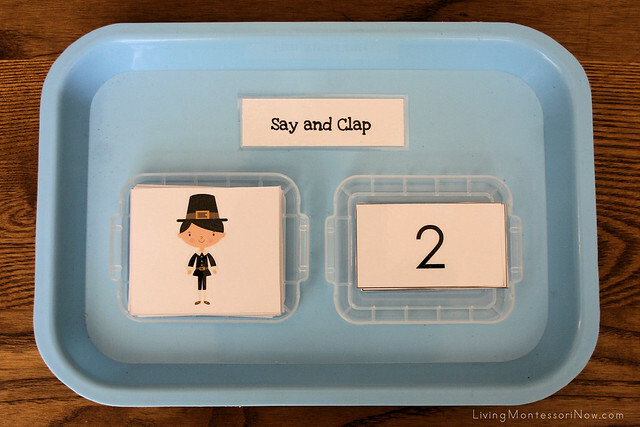 I would typically introduce an activity like this at circle time so that the children can begin to understand the concept of clapping and counting the syllables in words. The Thanksgiving greater than, less than activity uses one of the MANY printables from 3 Dinosaur's Thanksgiving Pack. 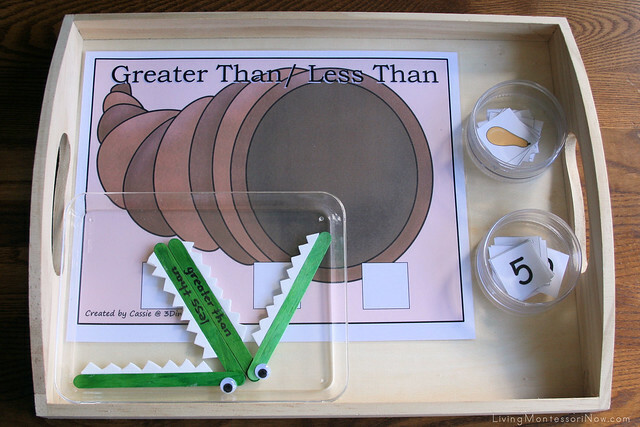 This greater than and less than activity actually involved food, so I couldn't resist the idea of using the greater than alligator and less than alligator from my Greater Than Less Than Alligator Math at PreK + K Sharing. You'll find directions for making the alligator manipulatives in my earlier PreK + K Sharing post. 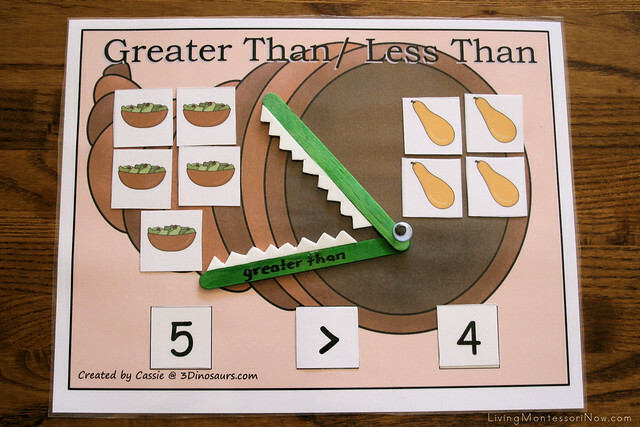 This fraction activity uses the Thanksgiving Printables ~ Kindergarten from Homeschool Creations. I just printed out, laminated, and cut out the materials and added them to a medium tray from Montessori Services. 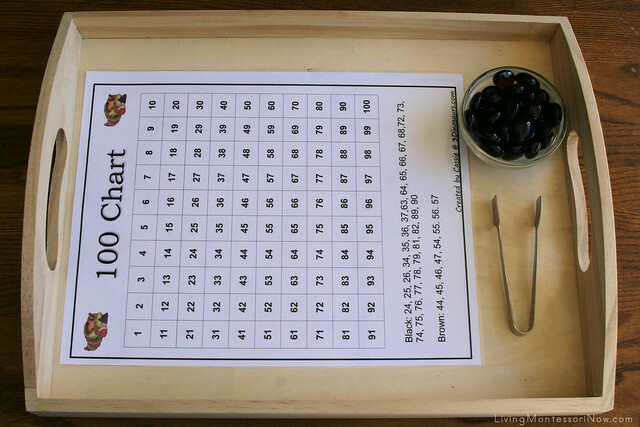 I love hundred chart art as an extension for the Montessori hundred board. This is another activity from 3 Dinosaur's Thanksgiving Pack. I added a sugar tong for a practical life activity as well along with brown and black glass gems. I have a Kids' Thanksgiving Activities Pinterest Board with Thanksgiving activities of all kinds and for many ages. I have a list of Free Thanksgiving Printables at Living Montessori Now. Deb Chitwood is a certified Montessori teacher with a master’s degree in Early Childhood Studies from Sheffield Hallam University in Sheffield, England. Deb taught in Montessori schools in Iowa and Arizona before becoming owner/director/teacher of her own Montessori school in South Dakota. Later, she homeschooled her two children through high school. Deb is now a Montessori writer who lives in Colorado Springs with her husband of 37 years and their cat of 11 years. She blogs at Living Montessori Now. Linked to Tuesday Tots, The Mommy Club Resources and Solutions at Milk and Cuddles and Crystal & Co. , Enchanted Thursdays Blog Hop, The Weekly Kid’s Co-op, Living Life Intentionally Linky Party, Preschool Corner, Learn & Link, Saturday Show & Tell, Show-and-Share Saturday, The Sunday Showcase, Link & Learn, and Afterschool Express. I always love to see what you have done with my packs! You always have such great ideas! you come up with the BEST activities and ideas! Feel free to link up @ Link and Learn :) Have a Happy Thanksgiving! Wonderful, again, I am impressed over and over with your vast knowledge and understanding of education and Montessori principles. You make this look so easy and I know it is not. The children benefit so much from your work and the links you share. Amazing! Where did you get the felt fall leaves (attached to the clothespins)?? I love them! Thank you for sharing these wonderful Thanksgiving activities. 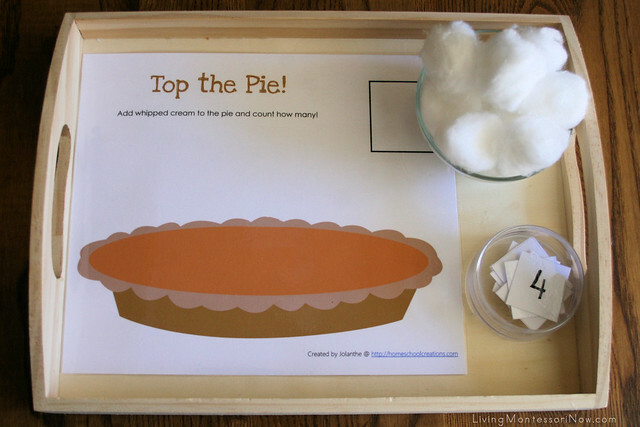 I love this top the pie activity. My 20 month old is just starting to really love counting, this is perfect for him. This is great - I just downloaded these packs today - LOVE the ideas!!! I love your activities. The say and clap looks especially fun as does your greater than/less than alligator. Great post Deb! Also thanks for the link to my printable. Just started following your site. Thanks for linking my Turkey freebie. A little singing, dancing AND learning! LET'S TALK (and SING) "TURKEY!" Stop and Work Folders with Freebies!